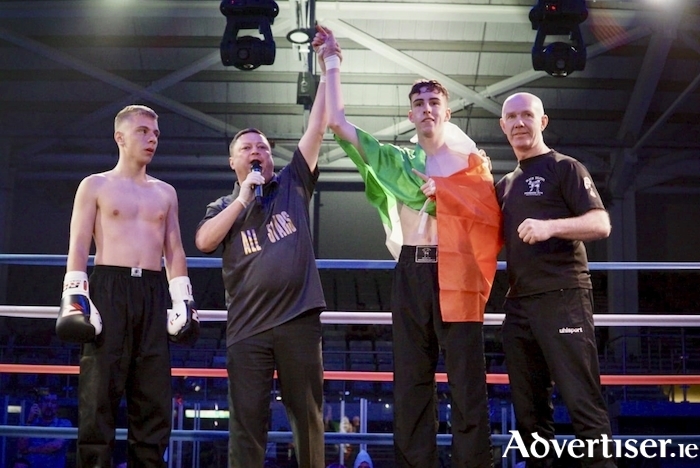 Galway Black Dragon Kickboxer Alex Fitzpatrick from Tuam has his hand raised by referee Pete Richardson at the Planet Ice arena in Milton Keynes on Saturday night after he knocked out his opponent from Cyprus with a head kick in the 38th second of the first round. Fitzpatrick is pictured here with a dleighted coach Pete Foley. The four county senior football quarter-finals are down for decision this weekend in two double headers at both Pearse Stadium (Saturday ) and Tuam Stadium (Sunday ). First game up on Saturday sees city side St James taking on Damien Comer’s Annaghdown (3pm ) in Pearse Stadium, and that is followed by Maigh Cuilinn and Mountbellew/Moylough at 4.45pm. Annaghdown and Mountbellew/Moylough would be the two sides expected to advance from those games. In Tuam Stadium on Sunday Milltown take on Salthill/Knocknacarra (2pm ) and that is followed by Caherlistrane and near neighbours Corofin at 3.45pm.